The Flyers' game plan apparently omitted scoring and goal-tending. After a pretty convincing win in Philly on Saturday afternoon, you have to wonder at what point during Sunday's rematch did the Flyers decide that they simply could blow off the game. The opening faceoff, perhaps? 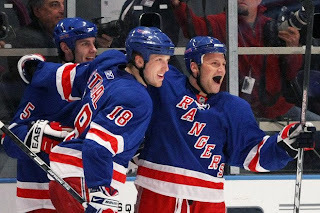 Because as was evident from their play and Coach John Steven's comments between the first and second period, the team decided that Sean Avery was the primary goal instead of winning a 2nd game in a row to solidify a playoff position. Official recap here. The game has been publicized all over the place because of Sean Avery's heroics so I will address him briefly before turning to some other thoughts. The "Grate One", as he is being called since his return, tormented the Flyers over the weekend and especially at the Garden with his offensive skills by tallying 3 goals (including 2 on Sunday) and distracting the Flyers generally. 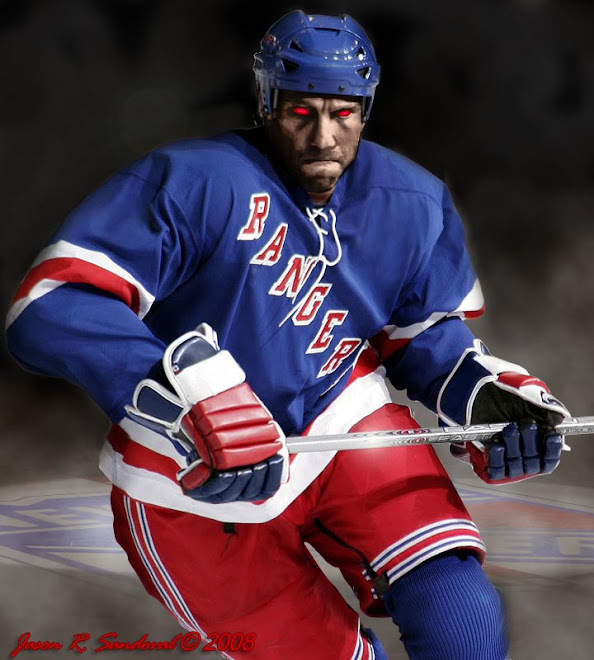 Thanks to his play on Sunday, the Rangers once again pulled themselves back into playoff position with a stirring 4-1 victory over the Broad Street Bullies, who gifted the Rangers with 9 penalties that ruined any offensive rhythm they tried to create and led to 3 Ranger power play goals. Since his return to NYC, Avery has done his part and more -- he has been skating, scoring and playmaking. He took a few boneheaded penalties earlier this week but he has shown admirable restraint when other teams have sought to provoke him. Yesterday's goalie interference penalty was downright laughable as he was pushed into Flyers goalie Antero Niittymaki and did what he could to cushion the fall. His overall play has energized others including Callahan (as if he could go to another level), Dubinsky, Scott Gomez, Girardi and Staal (on 2-1 odd man rushes, don't you feel more comfortable with one of these guys as the one? ), Betts (who was the darling of yesterday's NBC announcing team) and Sjostrom. Avery's play also has shown up the lack of speed, talent and/or heart of players like Naslund, Zherdev, Dreadd-en, and Roszival (the architect of several cover-your-eyes plays yesterday). Avery's impact has not been lost on the team's best defensemen. The newest Rangers -- Avery, Nik Antropov (who scored twice against Philly) and Derek Morris -- are showing me that I may have been wrong to denigrate these deadline deals. In fact, until Frederick Sjostrom scored to make the score 4-1, Antropov and Avery had scored the first 5 goals the Rangers had against the Flyers this weekend. With the higher level of skills brought by these acquisitions, the team's overall performance has risen. They have been scoring more (and may reach 200 goals for the season after all) and have not had to rely on shootout wins to embellish their won/loss totals. Still they lack an elite scorer which means that stinkers like the Carolina game (0-3) and Saturday's loss to Philly (2-4) are going to happen. If they reach the playoffs, this may be a fatal deficiency. Some may see a pretty face. . . .
but I see the key ingredient in the team's toolbox. For the 4th season in a row, the Rangers may not secure a berth until the very end. They have been lucky that Florida has been slumping and Montreal has been free-falling. While 4th or 5th place in the conference is not out of the question, 9th or 10th place is just as possible. Much depends on games this week -- the Rangers visit Montreal on Tuesday and then entertain Buffalo on Saturday before Ottawa arrives on Sunday night. Regulation wins in these games can go a long way to establishing a more secure position and perhaps eliminate Buffalo from the race altogether. For a quick view of the conference races, go here. If you look at other Eastern team records since early February, you can see why the Rangers are where they are. Only four teams competing for a playoff spot have fewer than 10 wins -- the Rangers are one of them at 7-7-3, with Buffalo (7-7-3), Montreal (7-9-2), and the suddenly moribund Bruins (6-9-3) the other 3 slumping teams. The best teams in the East right now are the Devils (13-4) and the Penguins (13-3-3). The Devils are 6 points behind the Bruins for 1st in the conference. The Pens, once left for dead, have been bolstered by the return of Sergei Gonchar and their trade pickups (especially Kunitz). They have caught the Canadiens in 5th and are right behind the Flyers (11-6-1) for 4th. They are making a run to get home ice for the first series. Carolina (10-6-2) and Florida (10-7-2) have played their way into the mix, while Washington (11-10-2) keeps a stranglehold on at least a 3rd seed. One final thought -- those pesky Islanders are enjoying the role of spoilers with defeats of the Devils, Canadiens and Black Hawks recently. They are taking advantage of teams that either are looking past them or are uptight. Thank goodness, the Rangers were 5-1 against them and are finished with them this season. The remainder of the schedule is tough enough. 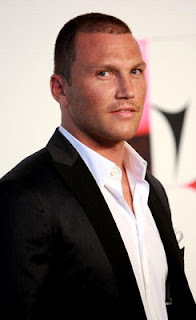 Tony, Sean Avery brings "attitude" that the Rangers lacked all season. It's plain to see. His style of play allows others to perform at what they do best. Avery will have some off nights, but having him in the lineup is better than not. The Rangers can't take take their foot of the gas. Playoffs are on the line! 600 grit sand paper is actually pretty smooth. I'd rate Avery at around 80 or even 40 grit.